This review is from a meeting perspective. Royal Caribbean’s Liberty of the Seas was the venue for the EGroup Communications fifth Annual “X-Change” a Mice Industry business forum. The Liberty of the Seas, along with 9 other ships, all offer some of the best meeting space and facilities at sea. These similar meeting spaces are versatile, wired for most a/v needs, out of the normal passage ways, and offer the ability to create one large room or 4 small rooms with a reception area leading into the meeting rooms. The purpose of the meeting was to introduce around 30 MICE suppliers of Hotels, Cruise Lines, DMCs and tourist boards to about 30 hosted buyers in the MICE field. The Suppliers all had a table and chairs with meeting schedule on two days for every 15 minutes. Meetings were held in the morning on the two sea days while the afternoons and evening allowed ample time for more in depth conversations and networking which took place in robust numbers.Impromptu conversations and networking was the norm. A good example would on the first day at sea Maui Jim did a fitting for everyone for their fantastic sun glasses. We were asked to meet in the Crown Lounge, which was open for normal business at the time, at 1:30 at staggered times for buyers and suppliers. In reality it seemed we all turned up at once and a really great networking and business session ensued. Lasting, for several hours, it was a great example of how a cruise ship can bring a group together without much effort. More importantly it truly seemed some business was taking place. Night times were equally as busy as well. Having the option to dine as the entire group or in smaller more intimate groups, which the Royal Caribbean ships offer, is a great way to start an evening. After dinner found the entire group going to see the hit Broadway Show Saturday Night Fever The Musial a great hit one night. In Vegas this show would easily cost $100 to $150 per person. Another evening found a large group seeing the Ice Show, yes an Ice Show at sea not to be missed. Others paired off in various lounges or the Casino for more chat and a night cap. Basically we all tend to think of cruises purely in the terms of incentive programs however a meeting at sea is entirely doable and your participants just might be more receptive to a cruise versus the same old hotel experience. For you as a planner it’s a piece of Cake. Numerous ship and shore activities are already planned and can be customized. No more worries about planning banquet meals as all cruise ships today offer numerous dining options some of which you can arrange on a private basis. No trucking your people to off property dining venues. A great mixture of night time entertainment is already provided. Meeting space and basic A/V is included in the price of the cruise in a variety of venues. Thinking on a bigger scale I am sure most of you had to see the Bud Lite commercials for their Bud Lite Super Bowl Hotel. What many of you might not have noticed that 4 cruise ships were chartered for the Socchi Olympics for guests and workers. As it turns out it seems that the cruise ships turned out to be the 5 Star accommodations for this event by all accounts. Ships of all different sizes can be chartered for various events. 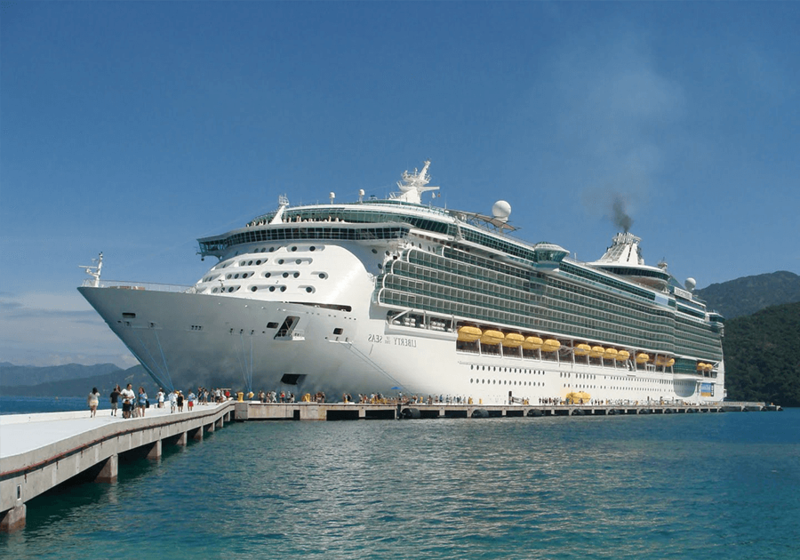 Commonly for big conventions where convenient hotel rooms are miles and miles away from the event Cruise Ships can provide an exclusive answer. Keep in mind it doesn’t have to be a big ship. We have access to numerous ships starting in the 100 passenger size range. These smaller more deluxe and intimate ships not only provide housing for the staff but also are great entertainment/dining venues for invited guests and of course a display of the product involved can be a permanent display on your chartered ship. Thinking out of the box can bring you great results and profit. The Liberty of the Sea is a great ship to consider for meetings and incentives. She offer 4 and 5 night cruises seasonally from Ft Lauderdale. The 4 night cruise is Thursday to Monday with only one port call in Cozumel, ideal for serious meetings. She also offers 2 five night itineraries either Monday to Saturday or Saturday to Thursday. Option one is Ft Lauderdale, at sea, Belize, Cozumel, at sea, Ft Lauderdale and the second one is Ft Lauderdale, at sea, Labadee, Falmouth, at sea, Ft Lauderdale. Call us for more details on a cruise ship can help you for an exciting meeting venue.